Thanksgiving is all about tradition. While the most famous traditions involve food, the holiday is about so much more than just what you eat. More than anything else, it’s a day devoted to gratitude. Thanksgiving is a day to appreciate your family, friends, and all of the wonderful things going on in your life over delicious food! 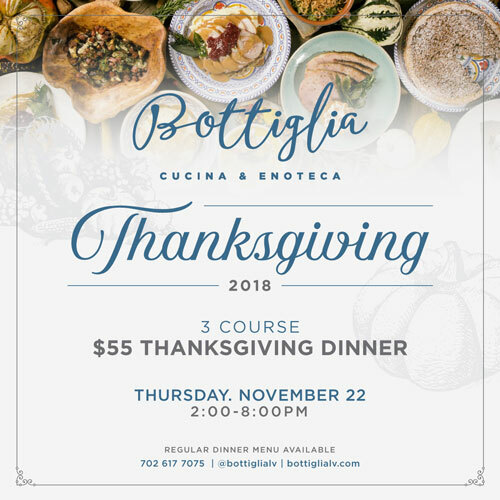 At Bottiglia Cucina & Enoteca, we want you to enjoy all of the best Thanksgiving traditions. We are offering up a special Thanksgiving Menu so that you can enjoy food, family, and/or friends and leave the dishes to us. We’re also offering a special pre-Thanksgiving Kid’s Brunch for some family fun time. 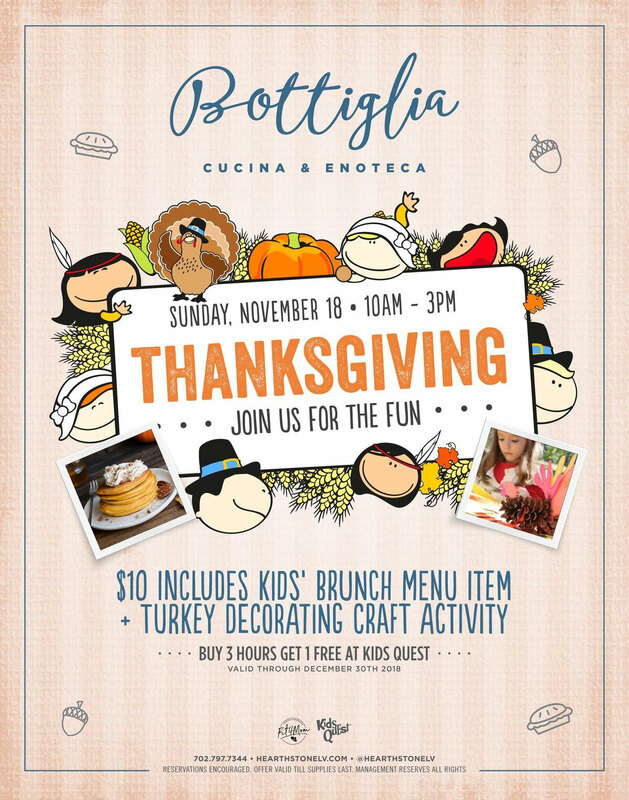 Here, we’ll dish on Thanksgiving traditions and how you can enjoy them at Bottiglia! Appetizers: Everyone loves to start off a holiday meal with appetizers. But at Bottiglia, we believe that the appetizers should be more interesting than carrot and celery sticks with ranch or mixed nuts. Butternut Squash Soup: Our creamy and earthy soup is topped with spiced crème fraîche, and finished with fragrant fried sage. Endive & Blue Cheese Salad: This appetite-inducing salad is served with tart apple dressing, black pepper honey, and candied Marcona almonds. Main dish: Typically, turkey is the centerpiece of the Thanksgiving table. However, it’s not necessary to have turkey at Bottiglia! Organic Tom Turkey Dinner: If you want to keep things traditional, this is the dish for you. Our turkey is roasted with sage butter, and served with chestnut and apple stuffing and giblet gravy. Prime Rib: Our richly flavored prime rib is served with herb fired potatoes and rosemary beef jus. Frutti Di Mare: Feeling like fish? This is the perfect plate for you. Our frutti di mare is made with spiced tomato sauce, and includes lobster, clams, calamari, and shrimp over house-made fettuccine pasta. Butter Whipped Mashed Potatoes: A Thanksgiving classic; ours are served with turkey dripping gravy. Stuffing: Our apple and basil stuffing is leagues above the stuff from a box–you’ll be tempted to order extra to take home! Pan Roasted Glazed Carrots & Squash: Flavorful and earthy veggies are even better with micro mint and toasted pumpkin seeds. caramelized Cipollini onion and wild mushrooms. Smokey Brussel Sprouts: Roasted to perfection, these sprouts are served with pancetta and lemon parmesan dressing. Pumpkin Cheesecake: A decadent pumpkin spiced cheesecake with a graham cracker and pecan crust, served a la mode. Roasted Granny Smith Apple Pie: Pretty as a picture, and with a classic flavor that’s fancied up with the addition of whipped crème fraîche! Thanksgiving is just as much (if not more) about togetherness than it is about food. At Bottiglia, we want to help you make the most of your connection. To help foster more family time, we’re offering a Pre-Thanksgiving Kids Brunch on Sunday, November 18th. This kids brunch is $10 per kid and includes a brunch menu item and a fun pinecone decorating turkey project. It’s bound to be great fun for kids and parents (or aunts, uncles, or guardians!) alike. Check out our Events page for more information! Conclusion: At Bottiglia Cucina & Enoteca, we want to help you create your own unique Thanksgiving traditions. We’ll be open on the holiday and offering delicious cuisine so that you can enjoy your family and/or friends without the time consuming prep or cleanup. Make your reservation today! 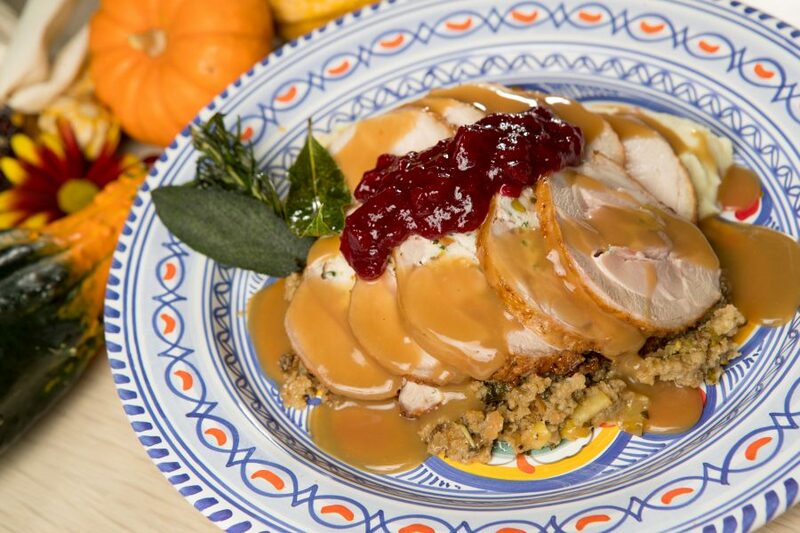 What’s your favorite item on Bottiglia’s Thanksgiving menu?